I’ve Written a Book and I Want to Self-Publish. Now What? We live in a world that has radically changed in the last couple of decades and the internet has fundamentally changed our lives. One of the most significant aspects of the internet age has been the rise of the independent artist and producer. The advent of both MP3s and indie bands have helped bring about a revolution in the music industry. Blogs and new media have brought about the near-implosion of magazines and newspapers. YouTube, Netflix, and Hulu have challenged the dominance of network and cable television. And Amazon heralded a new era of publishing in which brick-and-mortar bookstores—not to mention the Big Six publishers (Random House, Hachette, Macmillan, Penguin, HarperCollins and Simon & Schuster)—are struggling to stay alive. I’m assuming that you’ve decided against traditional publishing. If that’s not the case, this post—and much of what we’ll talk about here at Five J’s Design—won’t really apply to you. There are some basic foundational concepts we’ll talk about that you can apply, but the majority of the following advice is for the do-it-yourselfers out there. Revising, Editing, and Beta Readers – Get that manuscript polished. Manuscript Preparation – Prepare that manuscript for conversion. Manuscript Conversion – Convert that manuscript into an ebook. Cover Design – Give that book a great cover design. Print Publication – Ready that book for print. Marketing – Let people know that your book is out. 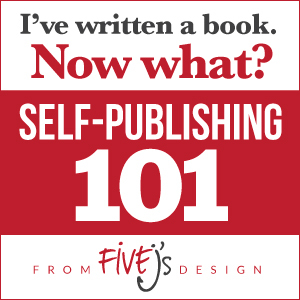 Along the way I hope to give you as many tips as I can to help you successfully self-publish your book. We’ll talk about things you can do on your own and give you the tools you need to get those things done, but we’ll also discuss those components that might be better left to professionals. The comments are open for any questions you might have. I look forward to hearing from you and helping your dreams of published success come true.